The LAP-BAND® System, as well as other gastric banding systems, is a purely restrictive approach to weight loss surgery that utilizes an adjustable gastric band to limit the capacity of the stomach. This is a fairly safe, short procedure which may be a good option as a more moderate weight loss surgery. LAP-BAND surgery in the Bay Area (San Francisco) is one of the more widely used weight loss surgeries, as it is often covered by insurance. In the procedure, an adjustable silicone belt is placed around the top portion of the stomach, which allows the patient to eat less and feel full sooner. The band is connected to a port, through which the device is inflated at intervals to facilitate continued weight loss. 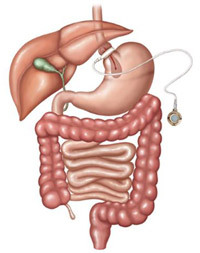 Saline is injected into the port to inflate the band, making the passage into the lower part of the stomach smaller. This restricts the intake of food, and allows the patient to feel full despite eating smaller quantities. Most surgeons performing LAP-BAND in San Francisco do so laparoscopically. The procedure typically takes about an hour, and most patients can return home the same day. Following surgery, nutritional modifications are key to successful and sustained weight loss. Most patients lose 50 to 60 percent of their excess body weight within two years of the procedure. There are advantages and disadvantages associated with gastric banding. For a more detailed comparison of weight loss surgery options, including gastric reduction duodenal switch procedure, vertical gastrectomy, and gastric bypass in San Francisco, visit our surgical options compared page. This resource can help you determine which procedure may be right for you. If you would like more information about surgical weight loss, click here to request a consultation with Dr. John Rabkin at Pacific Laparoscopy. Or you can call our office at 415-668-3200 to schedule your appointment.